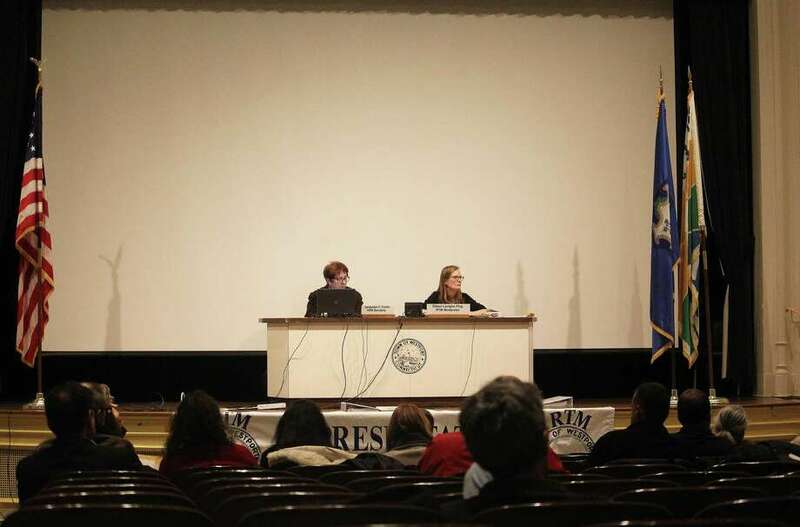 Moderator Eileen Lavigne Flug at the Feb. 7, 2017 Representative Town Meeting in Westport, Conn.
WESTPORT — When Eileen Lavigne Flug was halfway through college she boarded a plane for the first time in her life and flew to Las Vegas. “It was very eye-opening and I realized there was a lot of the world I hadn’t seen,” Flug, Westport’s assistant town attorney, said of her trip to Vegas, where she went to visit her aunt and uncle who lived in the area. Vegas was a far cry from the farm in Western Massachusetts where Flug grew up with her three siblings and parents, both teachers, in the small town of Petersham, population 1,000. “It was a great experience about being self-sufficient and resilient,” Flug said of her childhood on the farm. For her first two years of college, Flug, 54, attended the University of Massachusetts at Amherst, but, after visiting Vegas, Flug wanted to expand her horizons and transferred to the University of Nevada, Las Vegas. “Everything was completely opposite from how I grew up and that’s what made it so transformational and exciting,” Flug said of her time in Vegas, where she hiked in the desert mountains and met people from all over the country, many of whom where transitional, unlike the families from her hometown who lived in the same place for generations. After earning an undergraduate degree in accounting — Vegas is a great place to study accounting, Flug said — she enrolled at Pepperdine University in Malibu, Calif., for law school because she enjoyed her tax classes and thought she might become a tax attorney. Flug received a scholarship to Pepperdine, graduated first in her class, and served as the editor-in-chief of the law review. “I did everything they told me to do. I did all my homework,” Flug said of her success in law school, where she discovered she most liked corporate and securities law. As a third-year law student, Flug went on an interview trip to Washington, D.C., and, while driving around Virginia with a friend, realized she hadn’t been back east for the fall in five years and missed the changing of the leaves. Flug took an offer in D.C. to work in the corporate group of Arnold & Porter, where she worked for four years before leaving the firm and recreational activities she’d come to love in D.C. to work in New York City as the first in-house counsel for one of her favorite clients, a wine and liquor distributor. Ten years later, in the wake of 9/11, Flug and her then husband moved to Westport with their kindergarten-aged son and preschool aged daughter. Flug’s then-husband had grown up in Fairfield and Flug liked the area for its access to the outdoors. Upon moving to Westport, Flug stopped working as a lawyer and got involved with the League of Women Voters of Westport, where she learned how the town operates and met town volunteers. “It’s inspiring that people are so committed and devoted to our town,” Flug said. She’d been intrigued by the Representative Town Meeting and, in the run-up to the 2005 election was encouraged to run, and won, a seat on town’s legislative body. In 2010, Flug became deputy RTM moderator and in 2013, she took over as RTM moderator, leading the 36-member body to decisions on a variety of town issues. “I love the process. I love how process-oriented it is because the RTM provides a structure for group decision-making,” Flug said, adding, “The meetings go on as long as they need to go so that there’s a robust debate. I think that’s what I love the most. It’s just such a wonderful opportunity exercise of democracy,” Flug said. The RTM’s decision to move the YMCA from downtown to Camp Mahackeno was one of the most contentious issues Flug said she worked on as an RTM member, but noted RTM came together after the decision. Flug said she’s especially proud of the RTM’s 2008 decision to pass an ordinance banning plastic bags in town— the first municipality in the state to make such a decision. At the time, Flug was chair of the ordinance committee and helped tweak the ban, along with the ordinance’s sponsors, until it was just right. After Sandy Hook, the RTM passed a resolution asking the state to pass stricter gun control laws and sent the resolution to Westport’s state representatives. “I like to think that helped with their decision-making to know they had the support of the RTM along with the support of many others. The RTM has a history of getting involved with social issues like that,” Flug said of the Sandy Hook resolution. Flug returned to law in 2014, doing general corporate work and, when the assistant town attorney announced she was leaving Town Hall in 2017, met with Kelly to discuss the job. “I realized it was my dream job because it takes into account all the work I had been doing with the town,” Flug said. Although Flug is officially employed by the firm Berchem Moses, which the town engages for legal services, Flug is the only attorney that sits in town hall as a sort of in-house counsel for the first selectman and all town departments. On a day-to-day basis, Flug negotiates, drafts, and reviews contracts between the town and third parties, responds to Freedom of Information requests, and helps draft policy and ordinances for town bodies. “I like all of it,” Flug said, sitting in her office overlooking a blooming tree.